UCF is leading the charge for research on wetlands and climate change. Some of the findings are full of surprises — and might leave you full of optimism. It was the inaugural week of UCF’s Wetland Ecology and Biogeochemistry course. And to set a proper tone for the semester, Assistant Professor of Biology Lisa Chambers told students to wear their grubbiest clothes to class. She wanted them to get a good feel for field research — all the way from their fingertips to their toes. She’d supply the rubber boots. The “issue” is the relationship between wetlands and our changing environment. And Chambers knows the subject well. Her own interest was piqued while she was studying environmental science at Ohio State and heard a speaker from Louisiana discuss the loss of wetlands there. Chambers was so fascinated that she decided to do post-graduate work at Louisiana State, arriving just a few months after Hurricane Katrina devastated the area. “That was a clear illustration of how natural buffers, like wetlands, work much better than manmade buffers, like seawalls,” she says. Graduate student Havalend Steinmuller (left) works with Assistant Professor of Biology Lisa Chambers (right) during a wetlands field assignment at the Merritt Island National Wildlife Refuge. 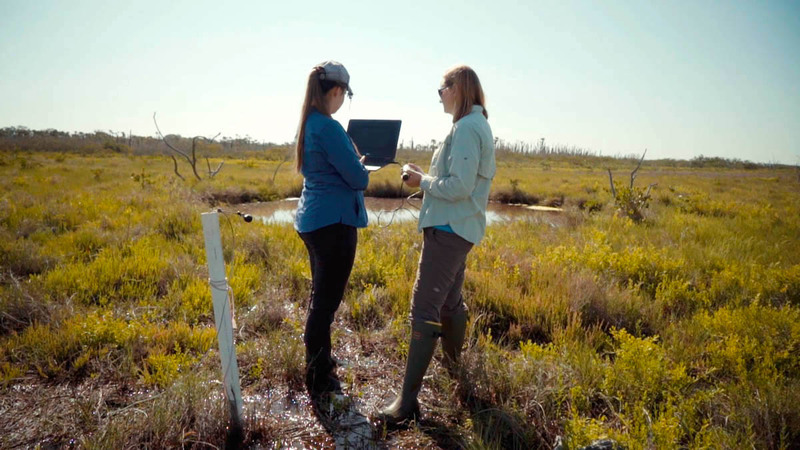 The whole scenario inspired her to eventually dig deeper into wetlands research in the ideal location: UCF. It’s a short drive to the Gulf Coast, the Atlantic Coast, the Everglades, and an even shorter walk to the 386 acres of wetlands that belong to UCF. Wetlands research at UCF does not exist in a bubble. Recently, the university launched the National Center for Integrated Coastal Research. The interdisciplinary initiative includes faculty from engineering, tourism, marketing, community politics, and biology, all offering expertise from different angles. “To advance the science and really make a difference, we need input from people from different disciplines of science — social, political, physical,” Chambers says. The Center doesn’t make the subject of our changing environment any more daunting than already is. Yes, development has infringed on ecosystems. Yes, biogeochemistry students can use incubators and measure for themselves the rate at which greenhouse gases are released into the atmosphere. But doom and gloom are not required elements in this research. First, an elementary lesson on the quantity of bacteria found in soil. There are up to 40 million bacteria in one gram of soil (a pinch of dirt). The bacteria break down and dispense nutrients collected over decades and centuries — what we know as decomposition. One of the richest ecosystems in terms of bacteria are wetlands. More specifically, peatlands, which are warm and wet and found all Florida. Among the matter that peatlands collect? Carbon. 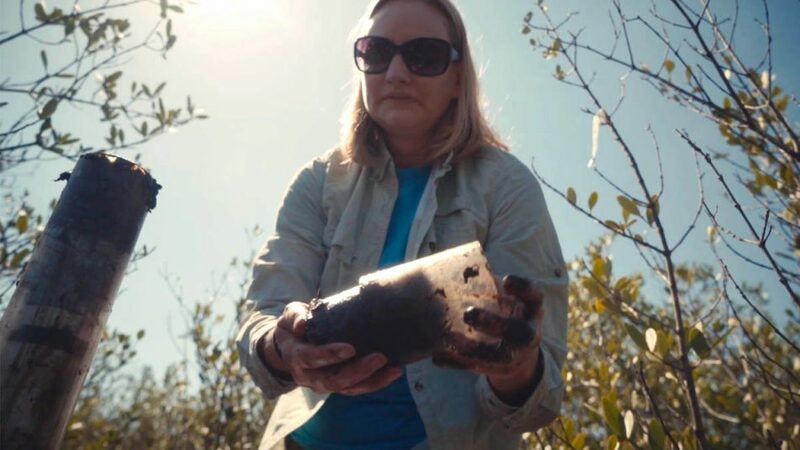 Assistant Professor of Biology Lisa Chambers collects a soil sample from the Merritt Island National Wildlife Refuge to help study wetland ecosystem changes over time. As saltwater inundates peat, the bacteria slow their decomposition process. The peat builds up vertically to stay above the water. Peatlands can also migrate, moving inland when necessary — as they’ve done off and on for centuries. If anything, this is all the more reason to protect our peatlands from development. But rather than focus on putting the proverbial toothpaste back in the tube, the Center agrees we should work together to ensure there isn’t further encroachment on our wetlands. Business leaders. Politicians. Scientists. We all have a high stake in preventing a massive loss of CO2 into the atmosphere. At the same time, Chambers’ research also shows we should not simply look at a changing landscape and assume the worst. The evidence is right outside our doors, in the peatlands.